Save time and save your budget with logistical help from the Alpena Area Convention & Visitors Bureau, the official film office for Alpena and the surrounding Northeast Michigan area. Several runway scenes were filmed at Alpena’s airport for Die Hard II starring Bruce Willis. The Outdoor Channel’s Fishing University TV series filmed several episodes in the Alpena area. Alpena setting attributes: small town charm, mystery, unique terrain, ocean-like scenes (without the sharks), forest, urban and industrial settings, inland lakes, extensive river system, and a helpful community. Alpena is a quiet community located in northeast Michigan on the shores of Lake Huron and the Thunder Bay River. With a population of 11,300, Alpena is the largest community in the region and is the hub for health care, education and technology within a four county region. The Alpena area features miles of shoreline on Lake Huron, three of Michigan’s largest inland lakes and the Thunder Bay River. Dotted with harbors and lighthouses, the Alpena area is also home to the Thunder Bay National Marine Sanctuary which protects 200 historic shipwrecks. Out in the country and along the shore, pristine forests, farms and fields, cabins and little towns and villages create a charming rural landscape. Large industrial buildings, a rock quarry, sinkholes, schools, many beautifully restored historic Victorian homes, churches, and other buildings offer a host of location possibilities. The urban warfare facilities at the Alpena Regional Airport and Alpena Combat Readiness Training Center – along with a nearly two-mile long runway provide unique location options. 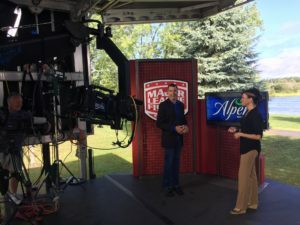 Mary Beth Stutzman, Alpena Area Convention & Visitors Bureau President & CEO, filming a commercial for Alpena to air on the Outdoor Channel’s popular Major League Fishing program. Please contact Mary Beth Stutzman with questions related to filming at (989) 340-2288 or email: marybeth@visitalpena.com.